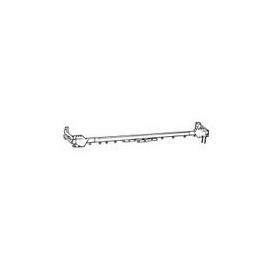 With traverse rod with cord draw set 9003 track, by Kirsch -- BasicQ Inc. Custom drapery rods. This is an assembled Cut To Measure set that includes hardware for mounting. Made of white finished steel for long service. By Kirsch. Plus truck freight over 104". Return If Wall --select-- None 2" 3" 4" 5" 6" 7" 8"